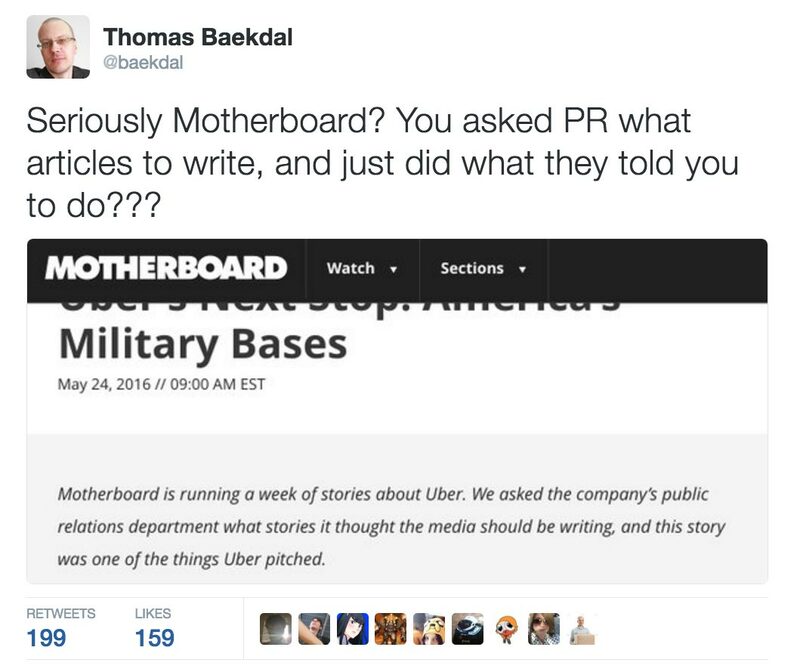 Yesterday, I retweeted a link about Motherboard and Uber that has gotten quite a bit of attention in the media world. And since Derek Mead, the Editor in Chief, has now responded to it, I wanted to bring it here so that people could see the context. Motherboard is running a week of stories about Uber. We asked the company's public relations department what stories it thought the media should be writing, and this story was one of the things Uber pitched. Mind you, this isn't a native ad. As far as I understand it, Uber didn't pay Motherboard to post this story. Motherboard did this on their own ... as part of a whole week of coverage of Uber. To me this sounds like a really bad case of Uber fandom. But, as I said, Motherboard's Editor in Chief has now responded, which came as the result of Cyrus Farivar reacting to my tweet, when he posted this. What followed is a short discussion between the two, in which Derek and Cyrus discuss this issue. I have copy-pasted the text here for easier reading, but you can see the original tweets in the reply-stream here. Baekdal: Seriously Motherboard? You asked PR what articles to write, and just did what they told you to do??? Cyrus Farivar: I just lost some respect for you, @motherboard. Derek Mead: Article, singular, which is part of our Uber theme week, which has otherwise pissed them off. We wanted to know what they think of themselves, and a) reported it and b) were transparent about the idea. Cyrus Farivar: So what if you piss them off? Cyrus Farivar: I'll admit I haven't read through the rest of your Uber coverage but respectfully, that still seems irrelevant. [...] I appreciate the transparency but I do think that if Uber's POV needed to be in individual pieces then it can go there. [...] I hear what you're saying. If I was in your shoes I wouldn't have made that decision. Cyrus Farivar: Alright. You've mostly convinced me. I concede the point. (Serious.) my apologies. Derek Mead: No need to apologize, I'm happy to discuss. We've debated this story for like two weeks (and are now IRL). And I too reached out to Derek to thank him for this clarification. Motherboard is running a week of Uber stories as a theme, like what many other publishers would do around specific topics. And the stories are both positive and negative to give us an all-round coverage. This particular story was what Uber itself wanted to highlight, and Motherboard covered it with a very visible disclaimer. This is certainly a lot better than the impression I had of this before. However, as a publisher, I still don't feel this is right. I think my biggest problem with this is that it's about Uber. Why do a whole week about a single company? Sure, Uber is big, but why not design the theme around what Uber is doing? I mean, why not create a week of 'the future of commuting', exploring not just Uber, but the entire market. Or a theme about the whole 'platform economy', or how our world of logistics is changing. Motherboard could also have focused the week on the problems and the opportunities of the distributed workers and how that impacts our society. This could have been far more valuable and interesting to me as a reader. For instance, Motherboard also posted an article about one guy who decided to quit his job to write a blog about Uber. Why do I need to know that? It has zero relevance to me. And this is what happens when you focus on the company, rather than on the trends the company is influencing. We don't need that article. It makes no difference to anyone. So, the reason why I tweeted the way I did was partly because of that disclaimer, and partly because this whole week feels like one big promotion for a single company, even though most of the articles are critical. It's a feeling that is even more profound when you look at Motherboard's site. 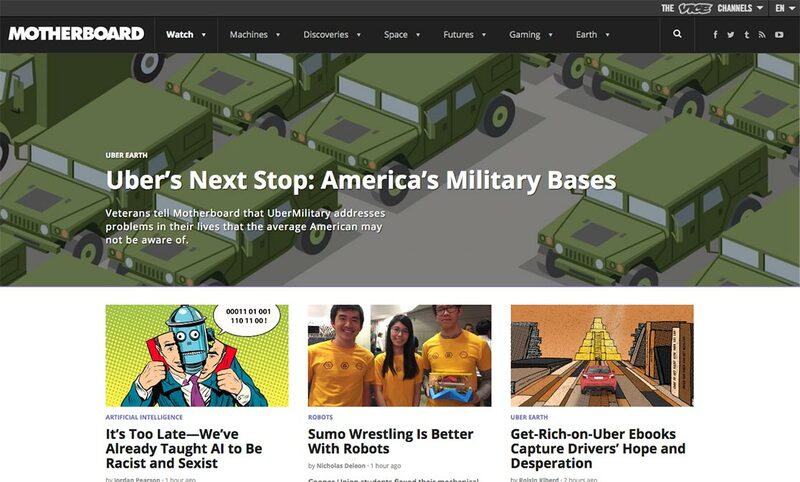 Here we see that the one article Motherboard has decided to feature is the one about Uber Military. Of all the Uber articles it has posted this week (some of which are good), why are you choosing the only one that is influenced by their PR to be the one on the front page? This just feels ... suspicious. Again, I could understand this if Motherboard was paid to run it, but that doesn't seem to be the case here. And it just feels like they are trying not to rock the boat too much. Although, it might also be because this article is getting the most traffic. In any case, now you know the context.